This year, like many American expats living abroad, my husband and I won’t be going home for Thanksgiving but will be saving the big trip to see family during Christmas. Lucky for us, we will be sharing this special holiday with our closest friends in town. 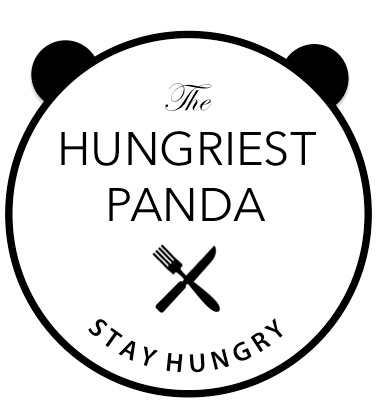 With the small kitchens and ovens we have in Shanghai, I wanted to share a recipe that’s hearty enough for the holidays but isn’t too extravagant to prepare and enjoy with a small group of friends/family. It’s even great for two. 1 whole Pork Tenderloin, Salt And Pepper, Olive Oil, Butter, Onion, Red Wine (optional), Low Sodium Chicken Broth, Cranberry Sauce, Rosemary. First, preheat oven to 425 degrees F or 218 degrees C.
Next, let’s do some prep work. 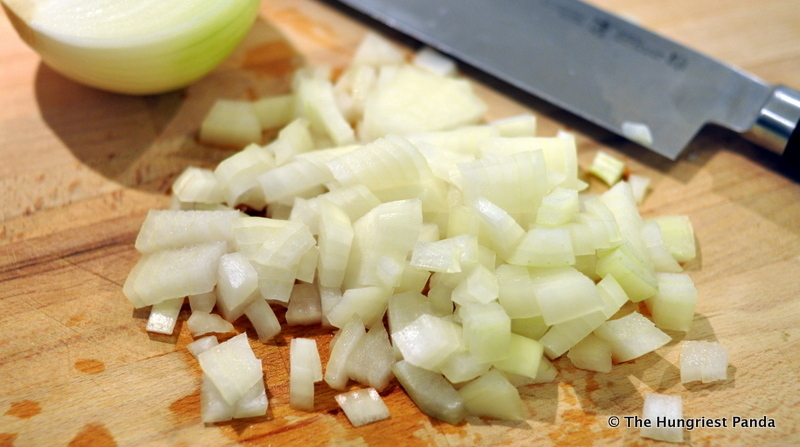 Chop up half an onion. 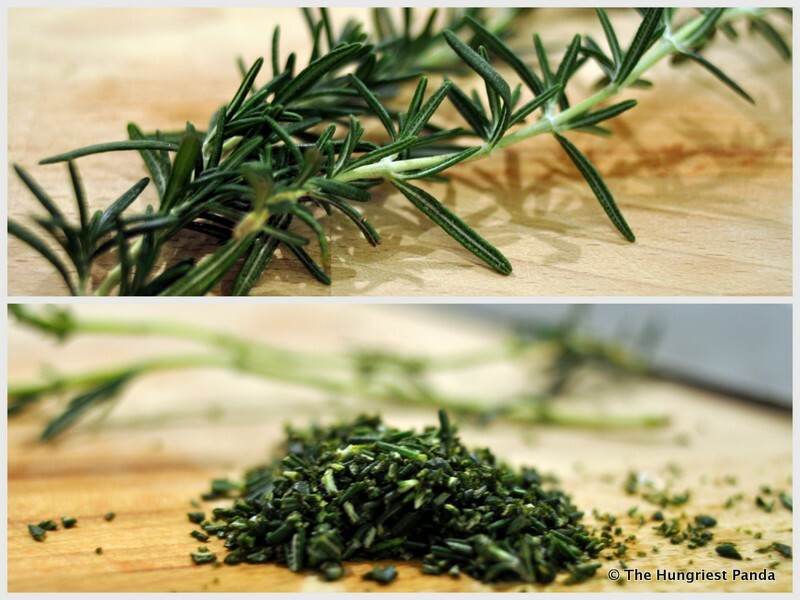 Get about 2 sprigs of rosemary. Take the leaves off stem and give them a good mince. Now, pour yourself a glass of wine. 🙂 Try not to drink it all before you make the sauce or reserve 1/2 cup in advance to make sure that doesn’t happen. 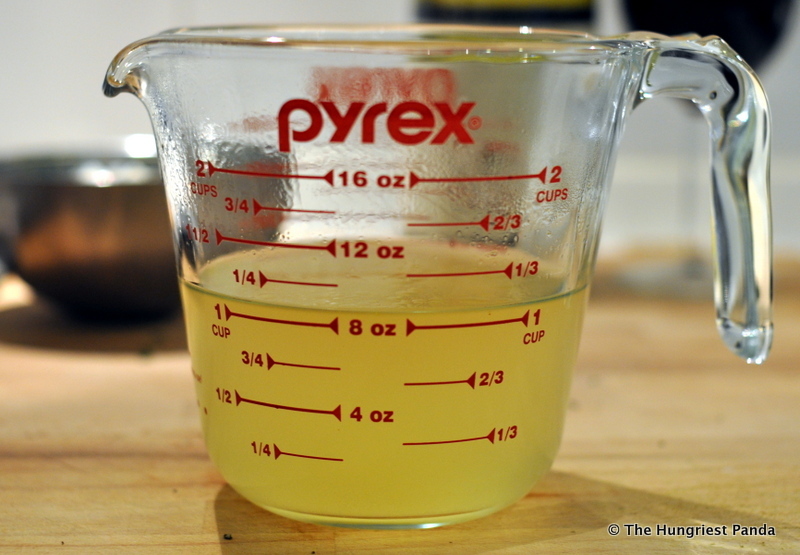 Next up I dissolve a bouillon cube in 1 cup of warm water to make chicken broth. If you have chicken broth on hand then you can skip this step. Now let’s start cookin! 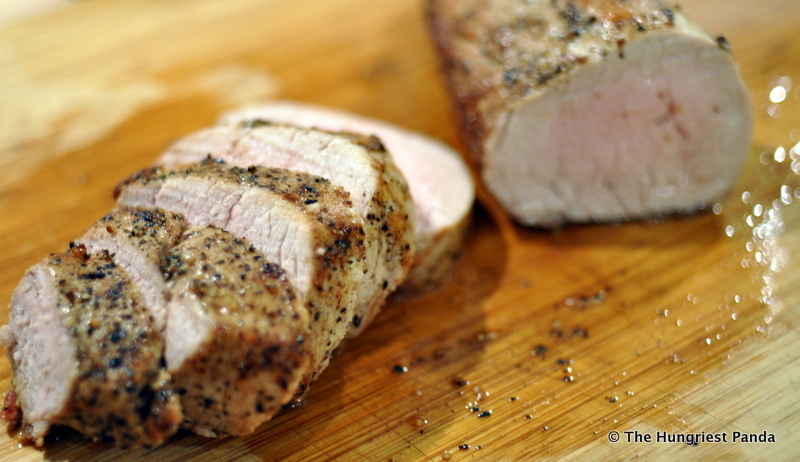 Rinse and pat dry the pork tenderloin and trim off any fat. Generously season the pork with salt and pepper. The pepper gives it a nice crust so don’t be afraid of adding a little extra. Heat 2 tablespoons olive oil and 2 tablespoons butter in a cast iron skillet over high heat. Sear the tenderloin on all sides, using tongs to move it around. Remove pan from heat and place in the oven for 10 to 15 minutes. Set your timer so you won’t forget. 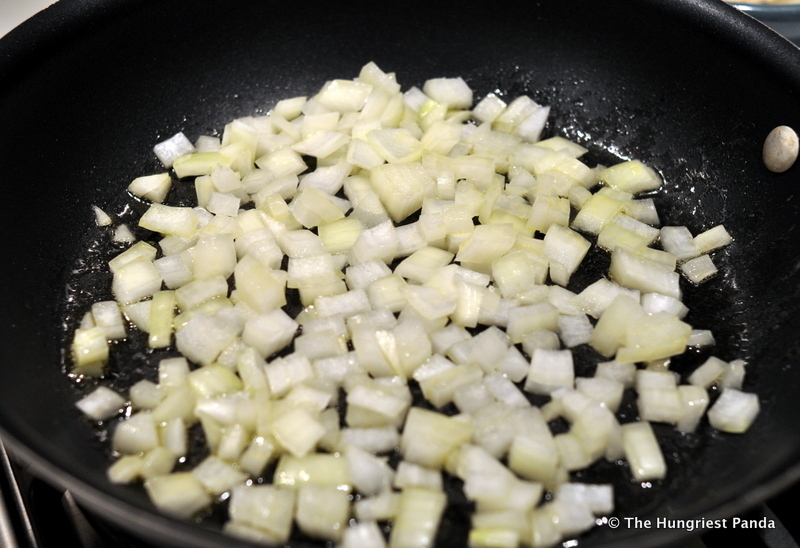 In a separate skillet, heat 1 tablespoon olive oil and 1 tablespoon butter over medium heat. 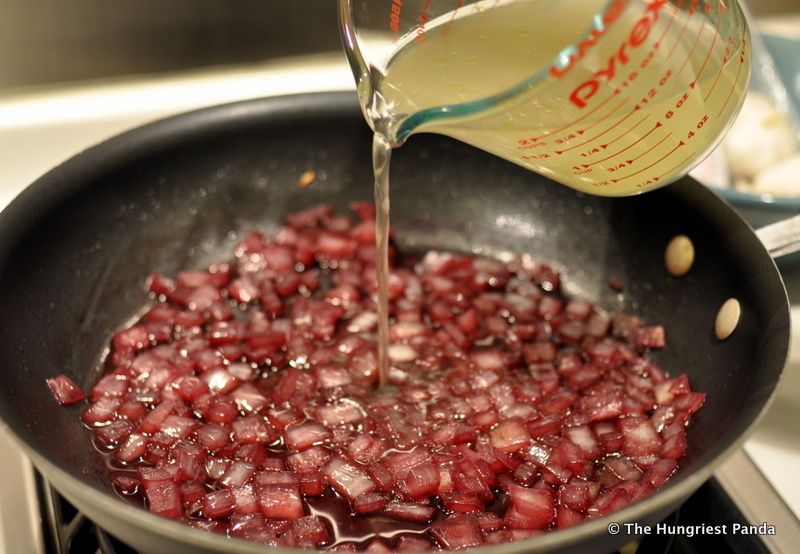 Add onion and cook for a minute or two. 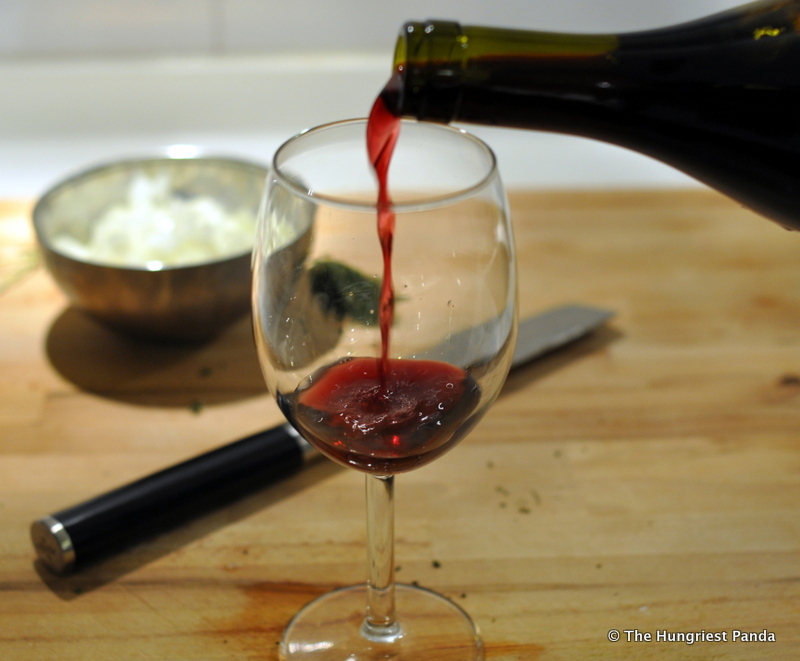 Pour in the 1/2 cup wine if using and mix together. After the wine has reduced about halfway add about 3/4 cup of chicken broth. If you didn’t use wine you can just pour in the whole cup of chicken broth. Sprinkle in the rosemary. 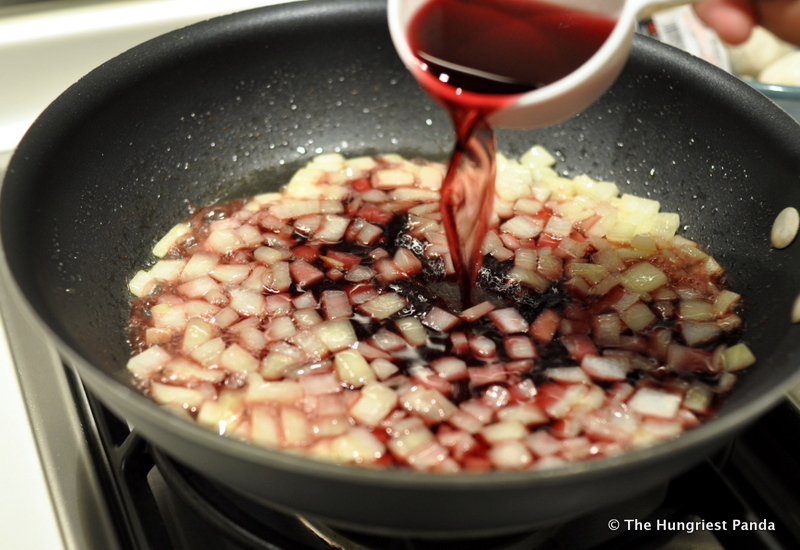 Stir together, then add a heaping 1/2 cup of cranberry sauce. Heat mixture over medium heat and cook for a few minutes. I cooked mine for about 8-10 minutes because I wanted it to be thicker. Add more chicken broth to achieve desired consistency. Check seasoning and add more salt or pepper if needed. 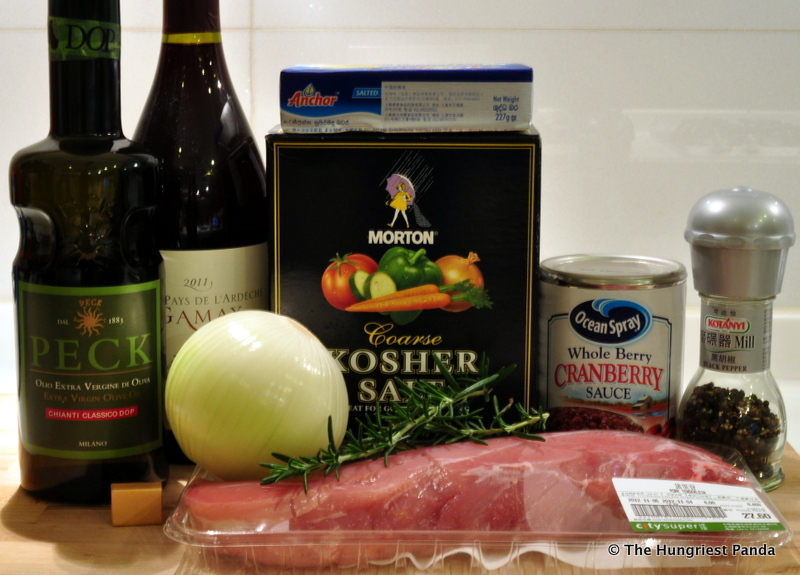 While the cranberry sauce is reducing, your pork should be about ready. 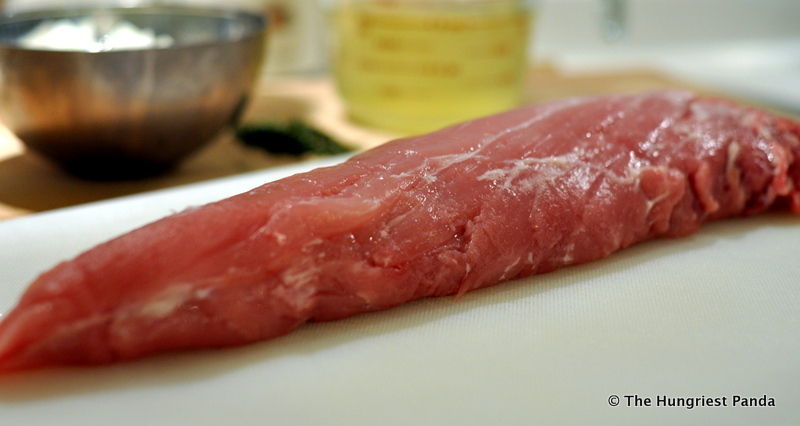 Remove from the oven and set the pork on a cutting board to rest. 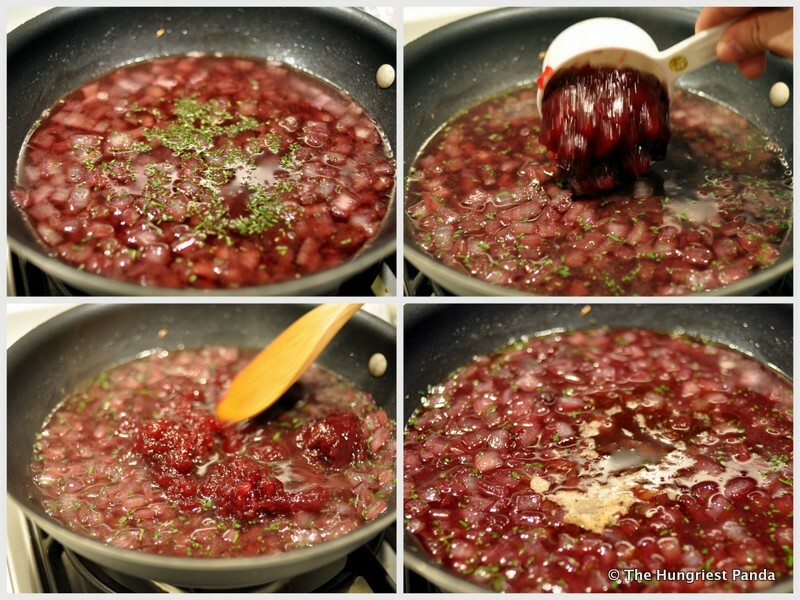 Pour in some of the juices from the pork pan into the cranberry sauce to give it some flavor. I used about 1-2 tablespoons. After allowing the pork to rest for a few minutes, slice pork loin into thick pieces and place on a platter or serve on individual plates. Spoon cranberry sauce over the top. Serve with mashed potatoes and other sides. I made some fresh steamed broccoli. 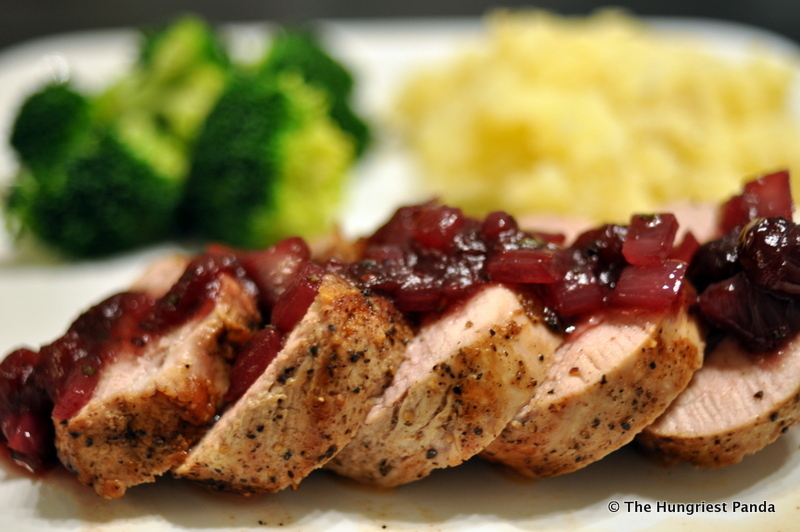 Serve the extra cranberry sauce on the table because you will want more! Trust me! You can double this recipe to serve a group and serve with more side dishes.